Keep your trees looking green, healthy, and fresh throughout the Christmas selling season. These are the perfect color enhancing products backed by years of devoted research and development. Single applications delivers uniform coloring. Produces a believable, natural color that wont wash off or fade from weather or sun light. Non-Toxic, environmentally safe, and contains no heavy metals or mercury. Super Pinegreen Super Pinegreen ensures a beautiful dark green color to pines that experience a natural yellowing process in late fall from ultraviolet rays. The color will not wash off, fade, and is harmless to trees, people and pets. Super Pinegreen Special Formula II Super Pinegreen SF II is a deeper version of our popular standard formula for those trees that may turn excessively yellow or for customers who prefer a darker green color. Virginia Pinegreen The surface of Virginia Pine needles is especially waxy. Our Virginia Pinegreen has been custom-formulated to coat the slippery Virginia pine needles with a beautiful color match. 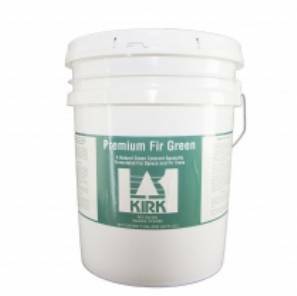 Premium Fir Green Premium Fir Green has the same excellent qualities as our other colorants but is specially formulated for true firs and spruce trees. Leyland Cypress Color Enhancer The unique color of the Leyland Cypress requires a spray specially formulated to enhance the delicate foliage. Our Leyland Cypress Color Enhancer makes a favorable difference at harvest.